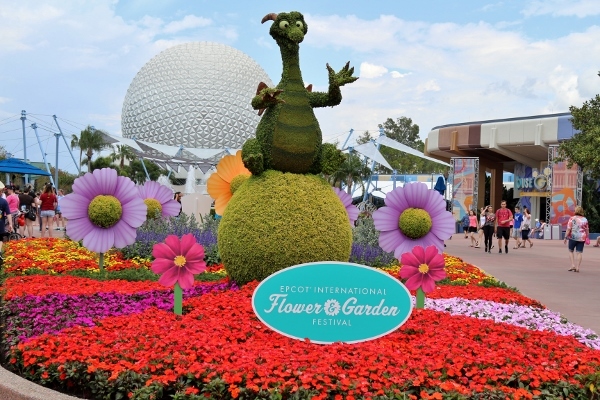 I recently visited Epcot for my third Flower and Garden Festival. 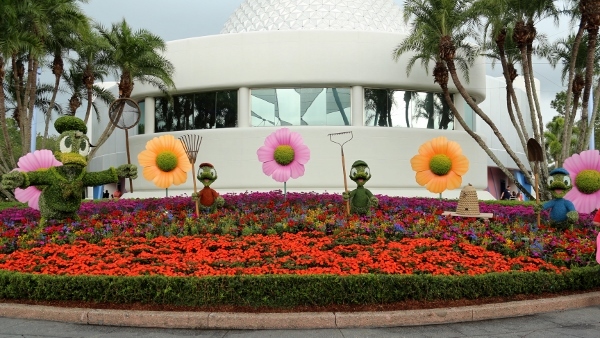 I absolutely love visiting Walt Disney World at this time of year. 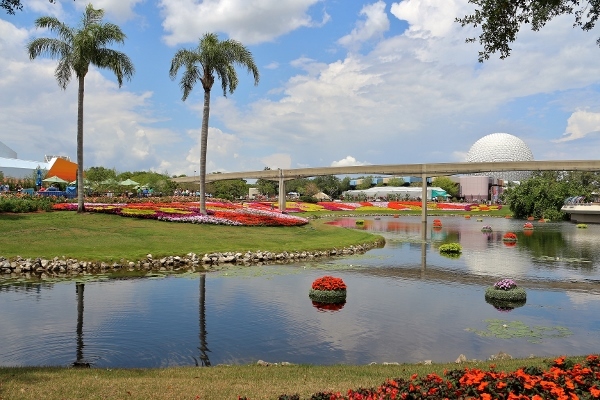 Not only is the weather generally great, but the gorgeous flowers at Epcot really steal the show. 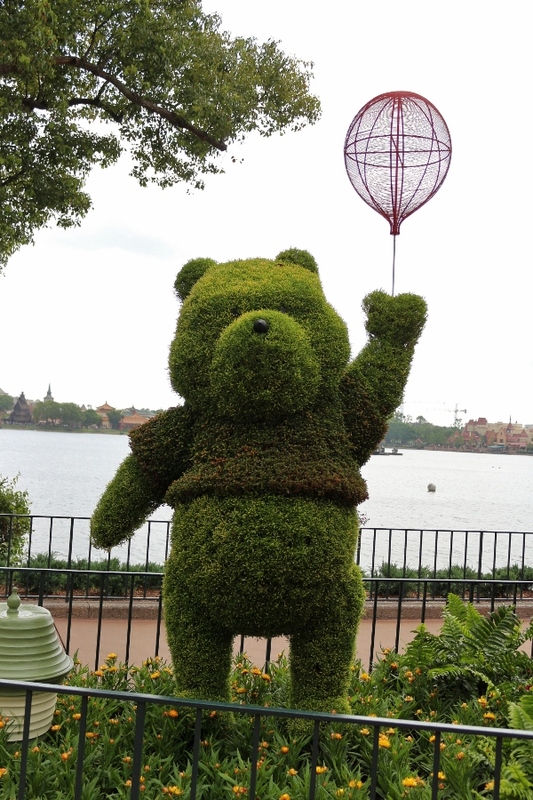 The topiaries are pretty incredible and range in theme throughout the park. 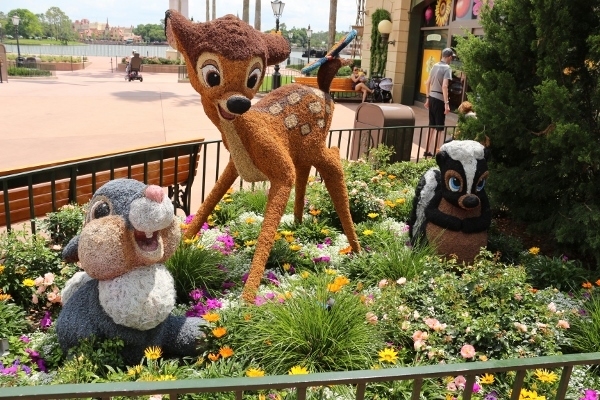 Everyone from Daisy Duck to Buzz Lightyear, and Winnie the Pooh to Bambi is represented. 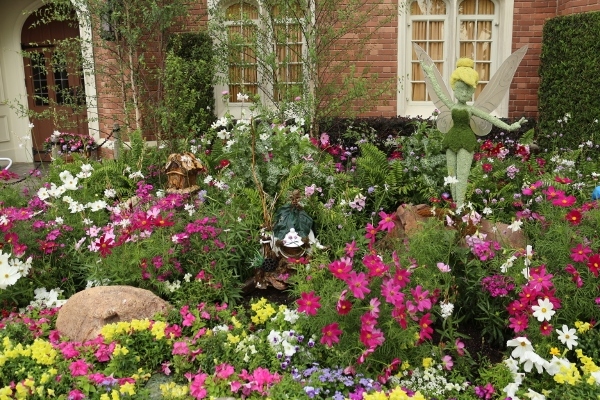 There are tons of other gardens and flowers of every color decorating the park. Pictures don't even do it justice. 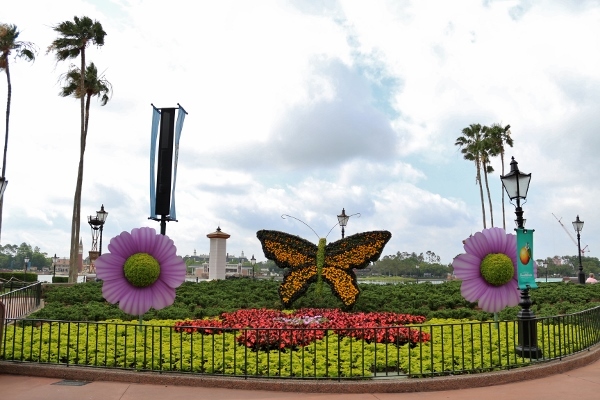 The park is so beautiful and colorful, definitely worth planning a visit in the spring to experience it yourself. 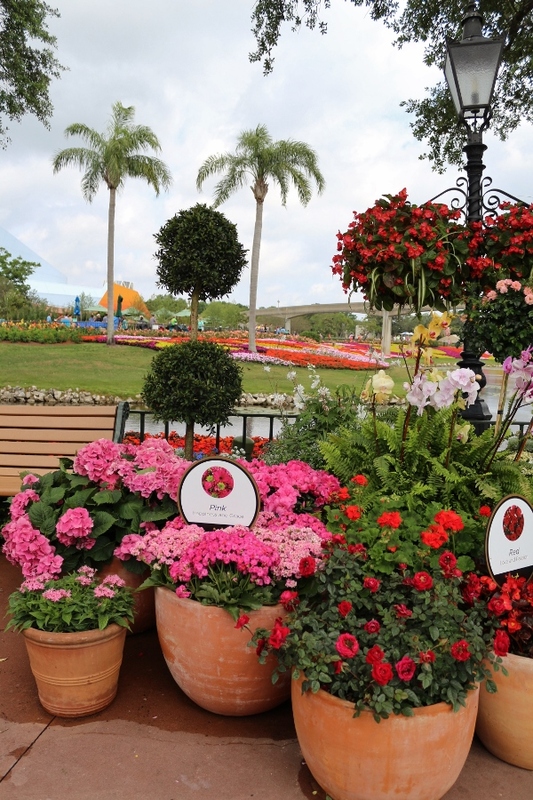 This year the event spans from February 28-May 28, so there's still plenty of time to go! 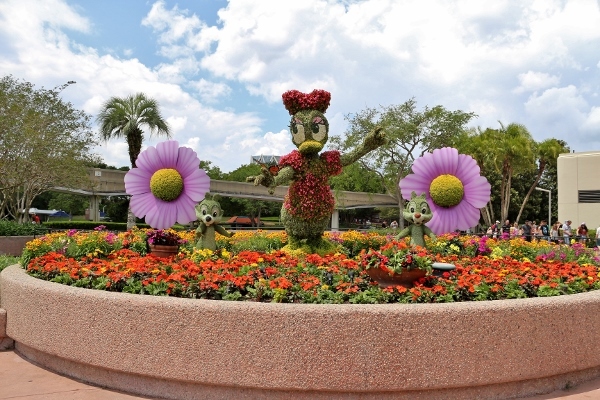 We had planned a couple days at Epcot this trip, but there was torrential rain and thunderstorms our second day at the park so our plans to visit more of the outdoor kitchens quickly changed to an indoor table service lunch instead. 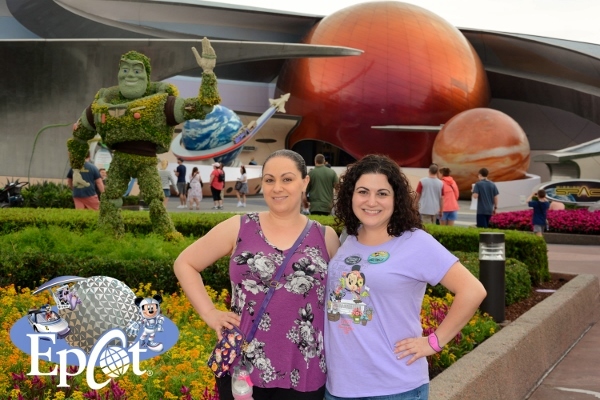 Although we had looked forward to checking out more of the booths, we really enjoyed the ones we tried on our first day, and I'm happy to share them now. 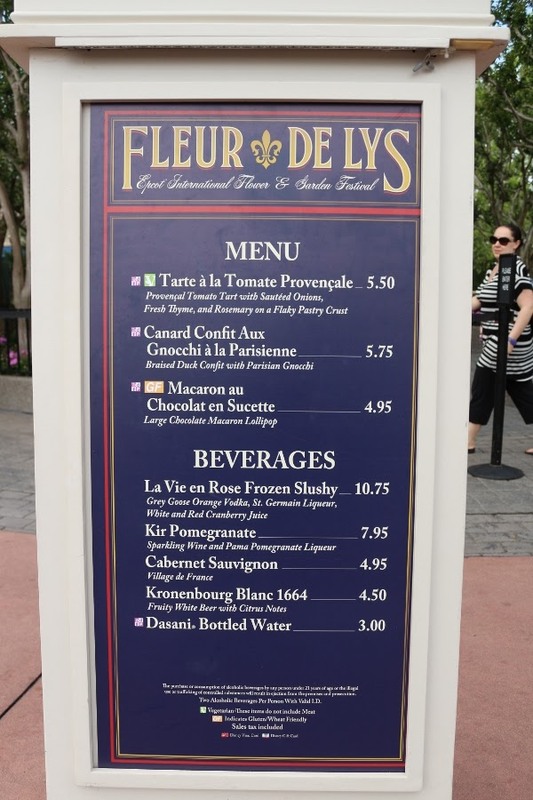 Our first stop was in the France Pavilion at Fleur de Lys. 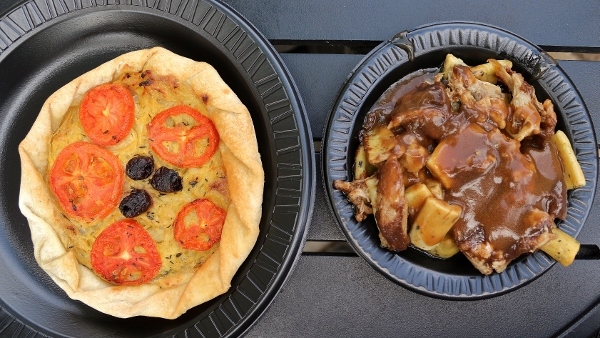 We were pretty hungry after our early flight to Orlando, so the three of us split three orders of the Tarte a la Tomate Provencale and one Canard Confit aux Gnocchi a la Parisienne. 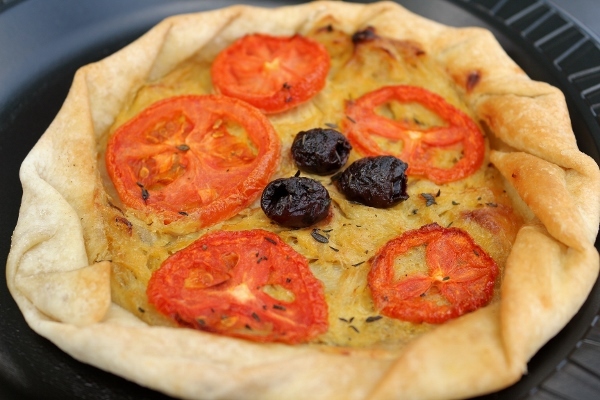 The tomato tart was delicious, with a crisp crust around the edges, and a thin crust beneath the sauteed onions and sliced tomatoes. Three Nicoise olives, and a delicate addition of fresh thyme and rosemary round out this popular choice. We also enjoyed the duck confit dish. Duck confit is duck legs slow-cooked in duck fat until they are tender and juicy and fork-tender. Served with Parisian gnocchi, which is made with pâte à choux. 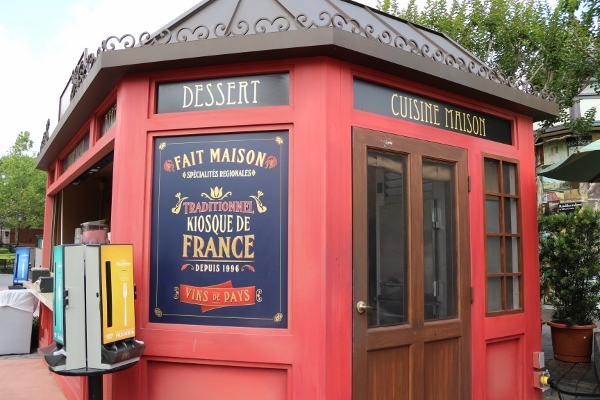 That's the same dough used for profiteroles, cream puffs and éclairs. The dumplings are poached and then baked. 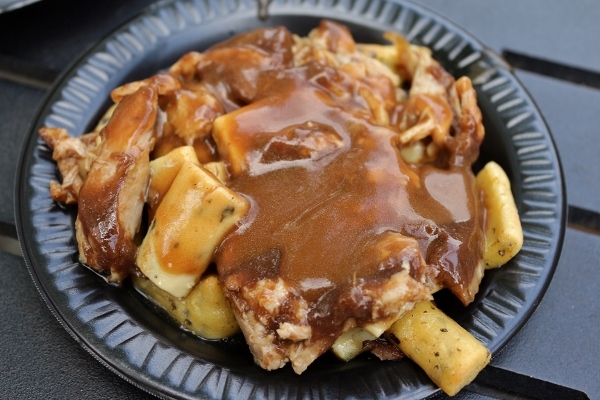 The finished dish is served with a tasty gravy. This was a delicious option, and one I'd highly recommend. 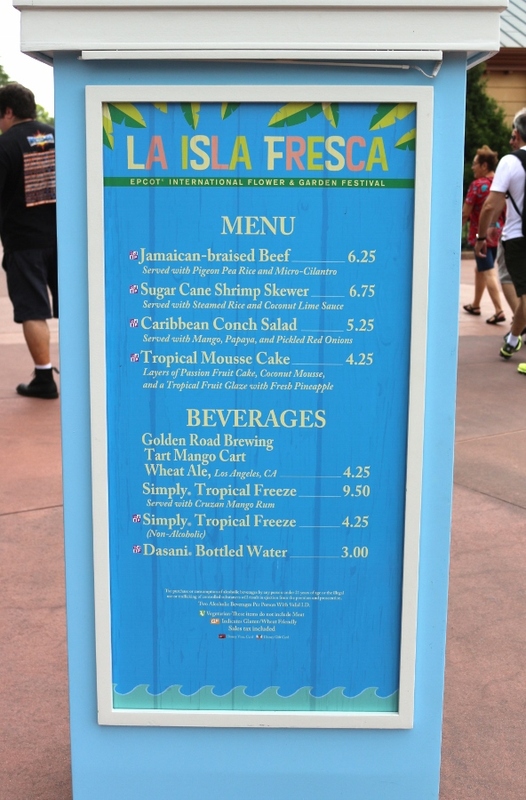 Next we headed back to La Isla Fresca, a booth we enjoyed at the Flower and Garden Festival back in 2016. 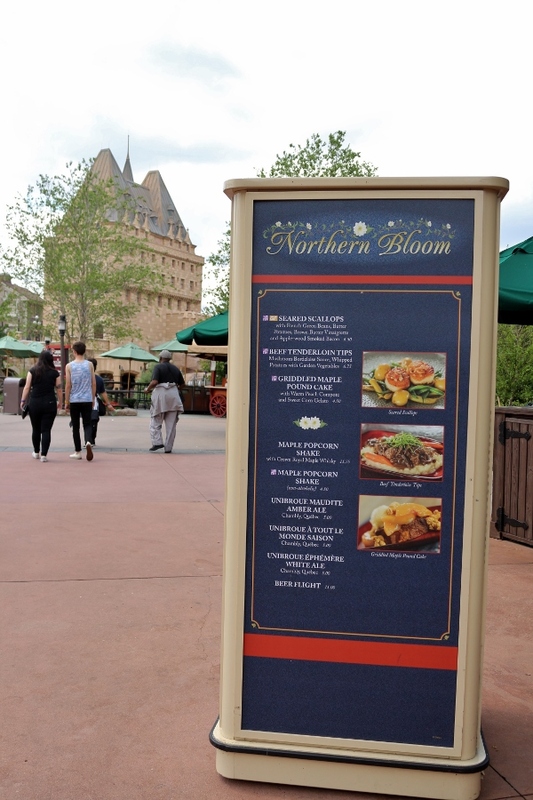 The menu has changed a bit over the years, but the food is still excellent. 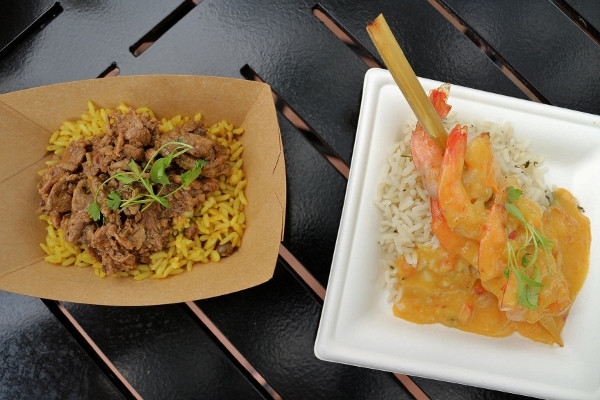 We selected two dishes from this menu as well, the Jamaican-Braised Beef, a dish we enjoyed at the festival two years ago, and the Sugar Cane Shrimp Skewer. 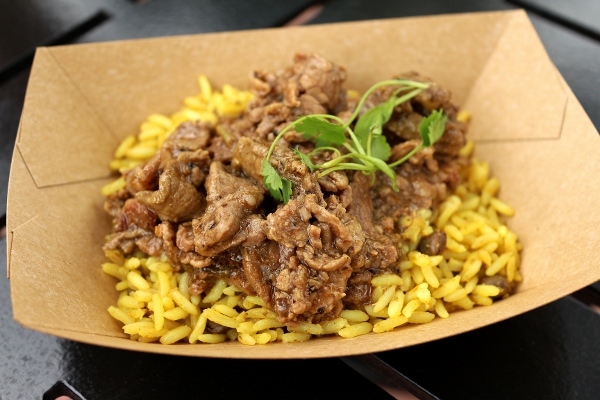 The Jamaican beef was prepared only slightly differently from the previous version. Two years ago, the beef was served in larger chunks, but this time, it's much smaller pieces. 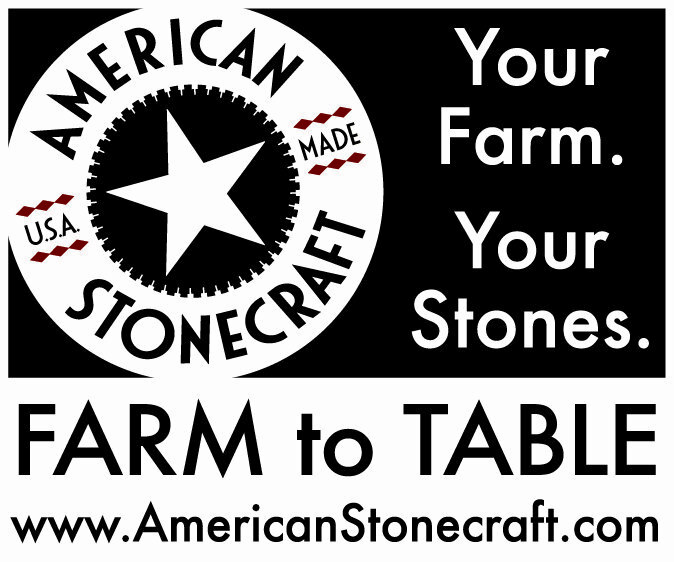 We prefer the updated version, and also find it much easier to share. It's a tad spicy, but so flavorful and worth ordering even on a hot Florida day. 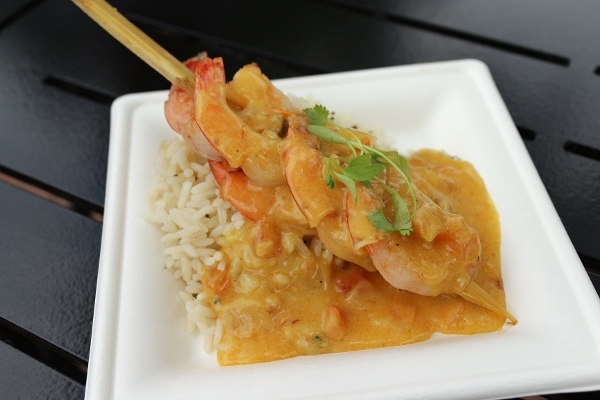 The shrimp is skewered on an actual piece of sugar cane, topped with coconut lime sauce, and served over steamed rice. The shrimp was also delicious, and less spicy than the beef. Although it was good, the beef was unanimously our favorite at this booth. 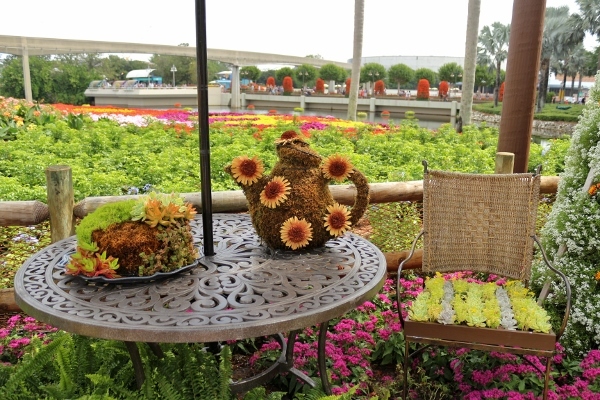 We headed over to one of the new booths this year, The Honey Bee-stro. 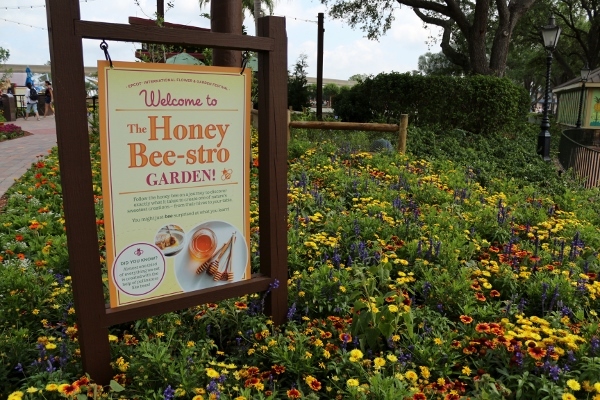 You can check out some of the lovely Honey Bee-stro gardens in the photos above! 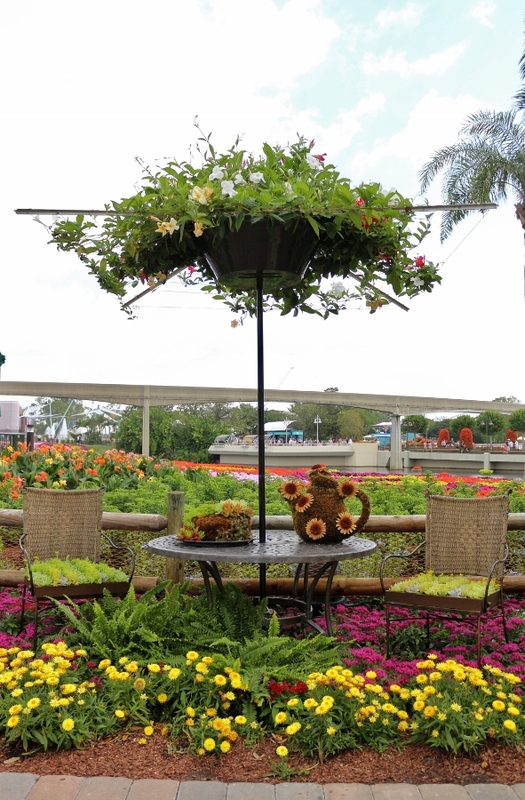 Prior to our visit, we had read wonderful reviews of some of the menu items at this outdoor kitchen, so we're very glad we were able to visit this booth on day one before our day two plans were rained out. The Roasted Cauliflower was high on our list, and although a completely vegetarian option it was one of the highlights from the day. 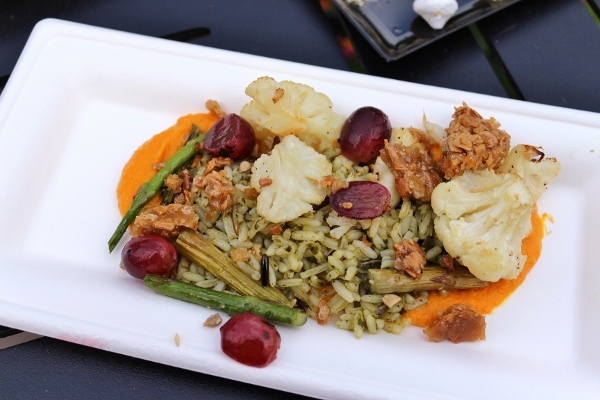 It's served with buckwheat honey carrot puree, wild rice pilaf, asparagus, honey blistered grapes, and sunflower brittle. Oh my. This dish is proof that you don't need meat to put together an outstanding combination of flavors. There was savory and sweet, crunchy and soft, all in a beautiful and colorful display upon our plates. 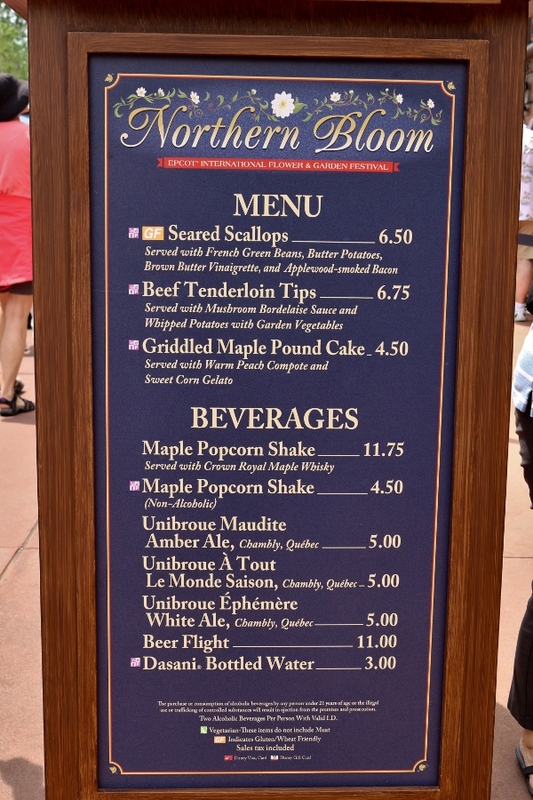 We selected a dessert and a beverage off this menu as well. 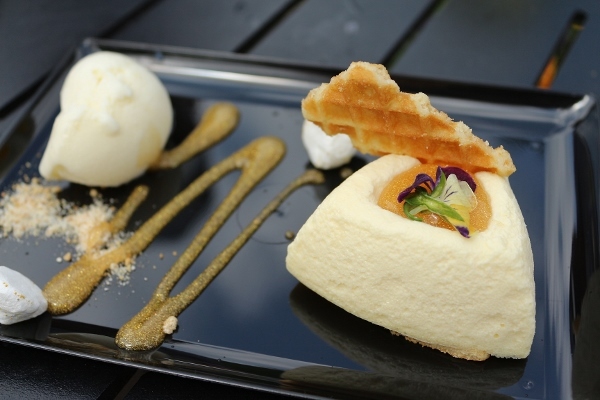 The dessert was a Local-Wildflower Honey Mascarpone Cheesecake, and it was sublime. 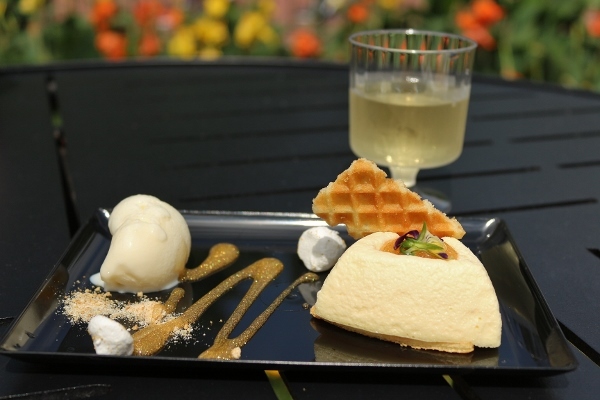 Served with orange blossom honey ice cream and fennel pollen meringue kisses, it's a unique spin on cheesecake that highlights the flavor and versatility of honey as a sweetener. And to really take it over the top, glittery sauce! 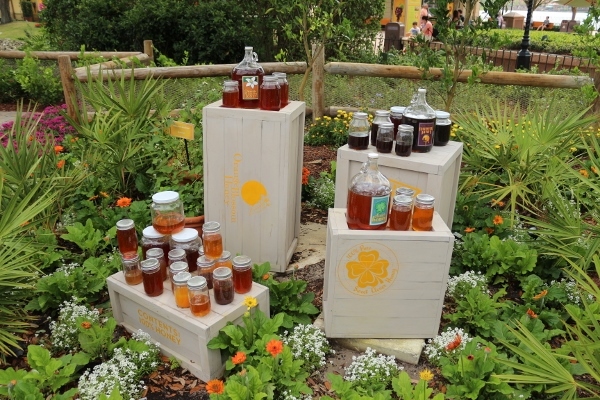 The Florida Orange Groves Winery Orange Blossom Honey Wine was a must-try. 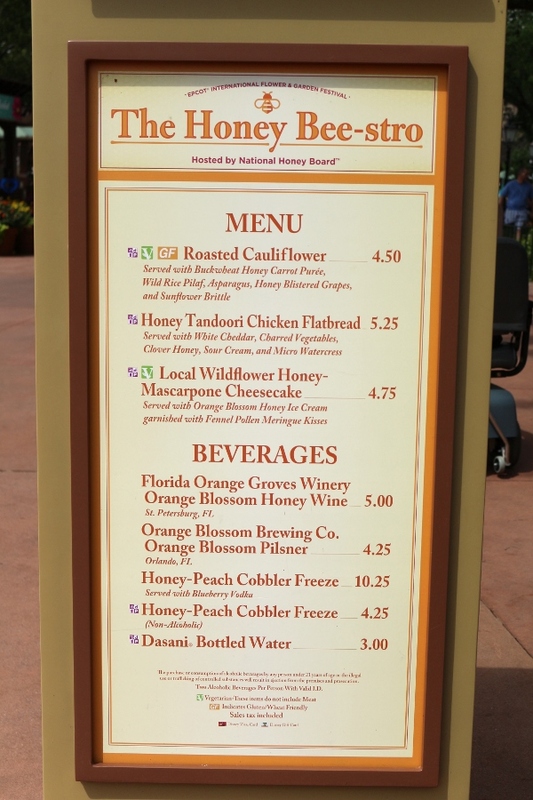 I've never had honey wine, but this was beautifully refreshing, and only slightly sweet. It was the perfect way to wash down our mascarpone cheesecake. 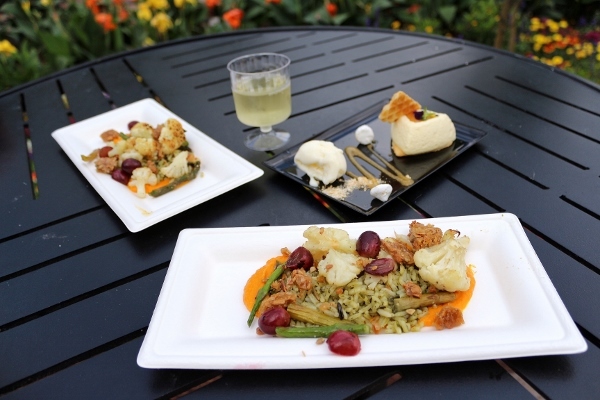 Our second dessert of the day came from the Northern Bloom outdoor kitchen in the Canada Pavilion. 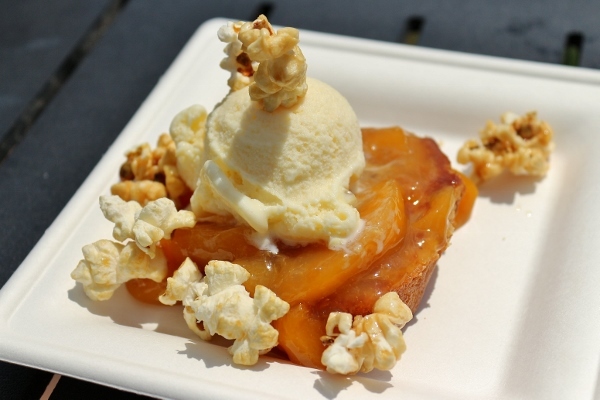 The Griddled Maple Pound Cake is topped with warm peach compote, sweet corn gelato, and caramel popcorn for crunch. 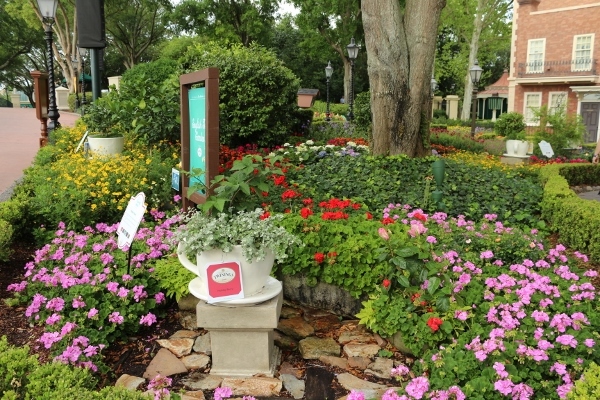 The sun was shining, so we hurriedly ate our cake before all the ice cream melted. Another great dish balancing textures, flavors, and in this case temperatures. 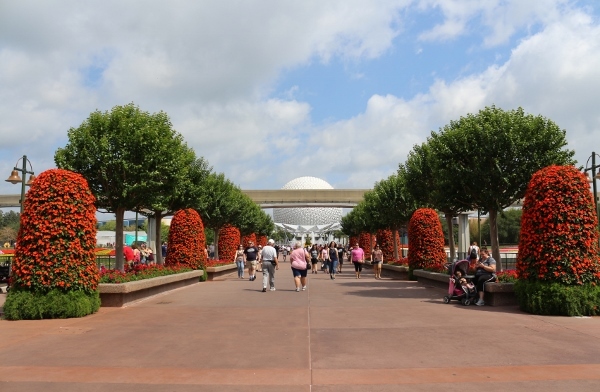 We had planned to visit a few more booths for lunch the following day, but as I've said the insane thunderstorms required a change of plans. 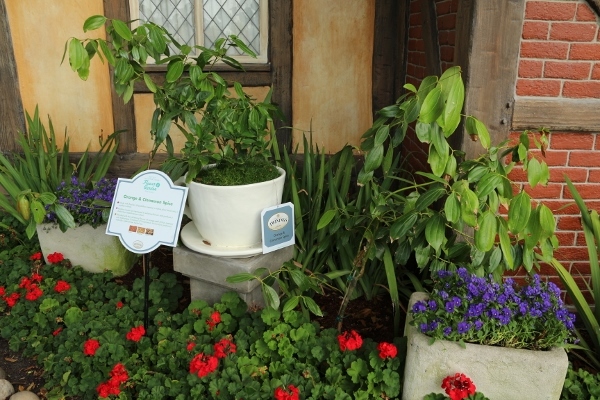 Even though we only visited about half the outdoor kitchens on our wish list, we have no complaints! Everything we ate was exceptional. 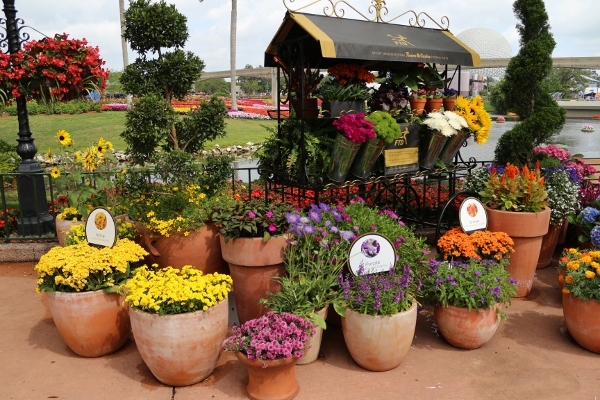 Not only did we thoroughly enjoy the food we tried at this year's festival, but as always we were blown away by the sheer beauty of all the flowers and gardens. 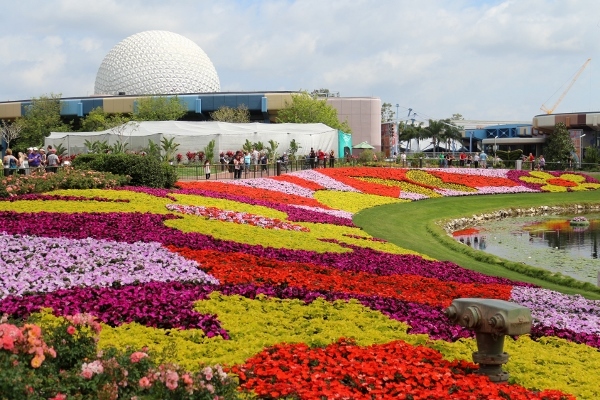 Although Christmas-time at the parks is also really enjoyable and super festive, this is probably my favorite time of year to visit Epcot because it's just so colorful and fragrant. 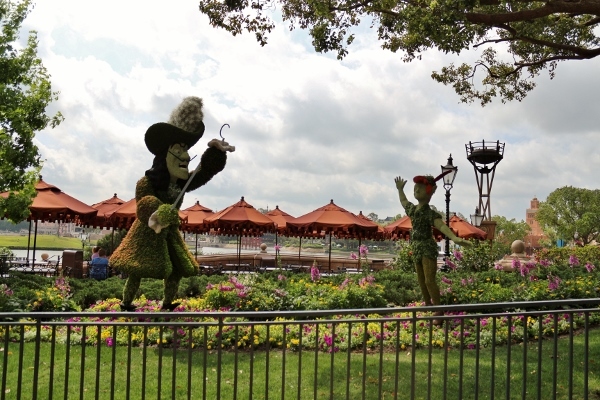 Maybe next year I'll be back again. Here's hoping!